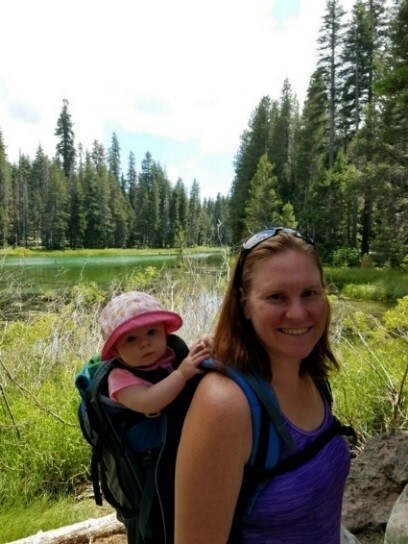 "When I found out I was going to be a mom, I began looking forward to sharing the experiences I had as a kid with my child." It was Saturday morning and like most Saturday mornings I was looking for excuses not to go to the gym. Ryan told me that if we went we could go to the class of my choosing. With the heat we’ve been having I immediately told him I wanted to do the aqua aerobics. Not being a senior citizen yet, he quickly tried to encourage me to try a different class. After much debate, Ryan suggested we just get out of the city and go camping. We didn’t have a reservation, we didn’t have a plan, and most importantly, I hadn’t made a list of everything we might need. I was immediately out of my comfort zone but with all of our other plans this summer, I realized this might be the last time this summer that we’d have the opportunity to take Abigail, our seven-month-old, camping. When I found out I was going to be a mom, I began looking forward to sharing the experiences I had as a kid with my child. 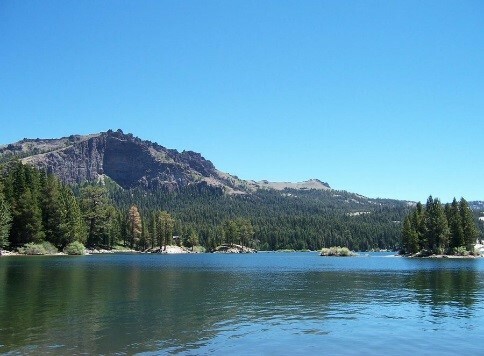 Growing up, my family would take trips to Silver Lake on Carson Pass. Usually, we’d take several trips throughout the summer, sometimes in coordination with my cousins. 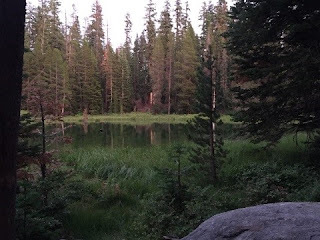 It was always a great time hiking, playing in the freezing water, roasting marshmallows, and just being with my family among the Lodge Pole Pine trees. Hands down, it is my favorite place on Earth. 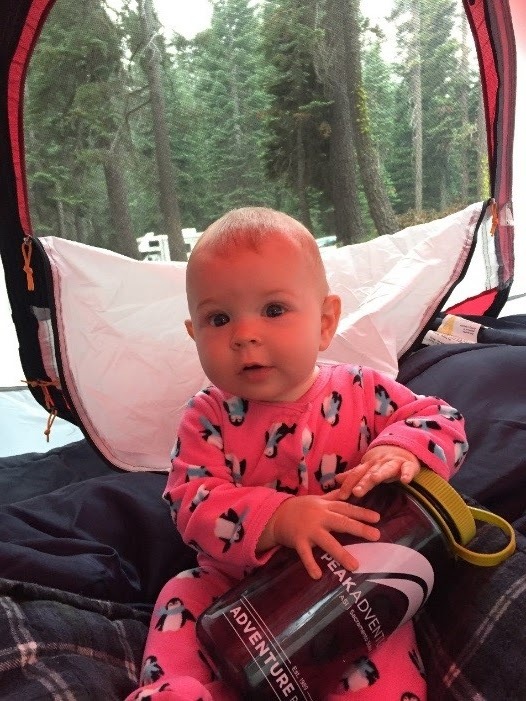 I wanted Abigail to have the opportunity to go camping sometime before she turned 1 year old and on Saturday, July 21st she just happened to turn 7 months exactly. What a better way to celebrate? But could we get a campsite somewhere? Ryan enjoys the coast so we looked their first…nothing. I knew Silver Lake would probably be full too, but as it turns out, they have a fair amount of sites that don’t take reservations. We decided that if we hurried to pack, we’d try our luck at getting a spot. Two hours later we were on the road and after a few quick stops, we were on Highway 88, moments away from Silver Lake. I was so excited. It had been about 8 years since the last time I was there and the highway had been moved. My parents told me that had happened, but the slight change made the whole place feel so foreign. The driveway into the campground was further down 88 than before so we made a few wrong turns before getting to the right spot. We stopped by the Camp Host on our way in to see if there were any sites available. We told him it would be Abigail’s first time camping and I think that encouraged him to help us scour the campground for a site. We lucked out! We nabbed the last spot available. It’s ingrained into me to set up camp right away, but Ryan wanted to get out and hike over to the lake. It was only 2:30 so we’d have plenty of sunlight for a short hike and get back with enough time to set up camp before dark. We packed up Abigail and our towels and walked along the “pond” near our campsite looking for the trail towards the lake. I wasn’t convinced we were going the right way. I have never stayed on this end of the campsite before so my barring’s were off. We backtracked a little bit and finally made our way to the entrance of the campground to look at the map. Apparently, we had passed 3 trails that would take us to the lake. Whoops! Thunder Mountain and Silver Lake. We eventually made it to the lake was as beautiful and as cold as I remembered. We dipped our toes in and let Abby splash around. I hadn’t felt that relaxed and happy in a very long time. I was at peace. I was at home. Don’t get me wrong, I’m generally happy and have had moments of relaxation, but there is something about Silver Lake that has always brought me so much joy. Maybe it’s all of the granite and Lodge Pole Pine trees, maybe it’s knowing that our family has been enjoying Silver Lake for 4 generations, or maybe because it smells so good, but going to Silver Lake every year growing up definitely left an impression on me. Silver Lake is where I first hiked, camped, and backpacked. It’s where my love for the outdoors was really created. We went on other trips as a family and when I was in Girl Scouts, but when I think of my outdoor experiences, my first thoughts are always of Silver Lake. It was with this foundation that I found myself interested in Peak Adventures. 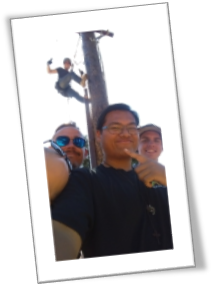 I was interested in the outdoors, had been to one ropes course and owned a bike; that made me the ideal candidate for a position with an outdoor program on a college campus, right? 16 years later I find myself managing the Challenge Center and if I think back to how I got here, it always comes back to my time at Silver Lake. After spending some time at the lake, we hiked back to camp, settled in, and started dinner. Ryan made a foil pack of veggies and grilled up some chicken and shrimp. Along with the bottle of wine we picked up at the Kit Carson Lodge General Store on our way back from the lake, we had a pretty darn good meal. We put Abby to bed and played a few card games as we sipped our wine. Once the sun went down we enjoyed the last of the embers in our fire pit before heading to bed. We had a pretty rough night. We put Abby on the queen air mattress between us. She wiggled all night. One of us always had little feet kicking us in the ribs. We were constantly turning her upright, but she would always find her way back to kick us. Needless to say, neither Ryan nor I got much sleep that night. The pond across from our campsite at dawn. Can’t you see Bob Ross painting this scene? I got up to use the bathroom at one point pretty early in the morning. As I crawled out of the tent I saw the pond across the road. It was beautiful. I crawled back into my tent to grab my phone for a picture. I accidentally woke up Abby. Luckily, Ryan was so tired it didn’t wake him. I was able to take the picture, do my business, and get back to the tent quickly enough to make sure she didn’t wiggle off the air mattress or wake up Ryan. When it was finally time to get up, we were moving pretty slow. We boiled water for coffee and slowly began to wake up. Abigail was bright-eyed and bushy-tailed and was ready to start the day. Seeing her happy face in the morning is hands down the best way for me to get my day going. 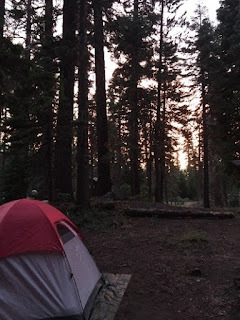 As I sat at the picnic table with my little family at Silver Lake, sipping my coffee, and listening to the rest of the campground wake up is a memory I will never forget. It is simple, but I was just so happy to be able to share that moment, that location, with Ryan and Abigail. Abigail is ready to start the day. After some yummy breakfast burritos, we packed up camp. There was one more place I wanted us to visit before heading out of the area; the day use beach my family would go to when we’d take day trips to Silver Lake. Since it had been a while since being there, I either forgot that you had to pay to park or it is a new thing. We were short on cash so we scrounged together all of the coins we could find. Luckily we were able to scrape together the $5 needed to park there! We walked around the little lagoon to my favorite spot and let Abby splash around in the lake again. Unfortunately, it was getting smoky from a fire near Yosemite so we decided to leave after about 45 minutes. Our drive home was pretty uneventful but it allowed me to take some time to reflect on how special this trip was for me. My grandpa took my dad, my dad took me, and now I am getting to take my daughter and family to Silver Lake. I am not only continuing a tradition of going to a beautiful location, I am hopefully continuing a tradition of love for the outdoors. I love that place. I've been there a ton of times. Great article, Val. Abigail is a lucky girl! Keep up the journal, Val. It's something I tried to do too. Have the pictures but only memories, not much written. What a treasure Abigail has in you. Your folks raised a wonderful daughter. Steve's not bad either.Blessings to you, Ryan and Abby. This is really a wonderful website. An intriguing discussion is worth comment.